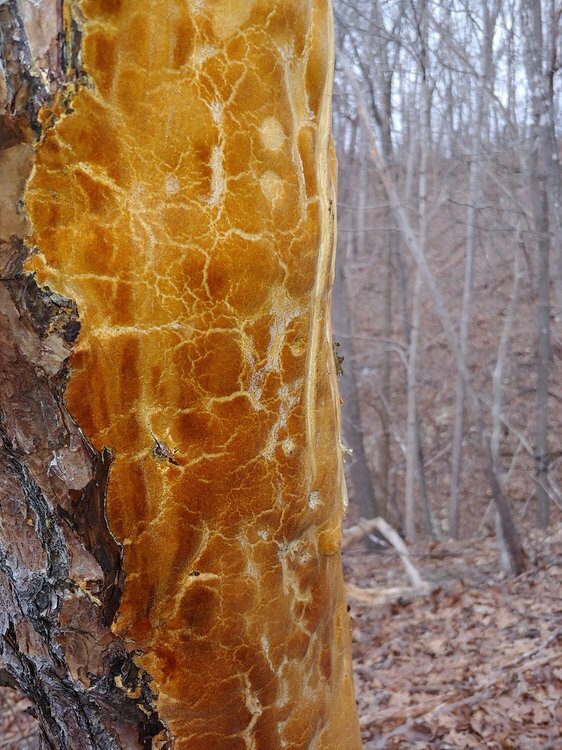 I have this interesting and quite large (3 to 4 ft in length, seems like) orange parchment hanging around my local conservation in the stripped bark of a pine tree (my apologies for not being skilled enough to nail the species of the tree). Up close to it the entire fruiting body seemed pretty meaty as if it would make a great mushroom head on the forest floor, not at all like a jelly fungus or other parchments I've seen. I didn't have time to collect much on it so if there is enough interest I could return to it tomorrow and see what else I could collect that would help. I refrained from removing any of it because there was a stern sign that said $500 fine for "disturbing wildlife" which could mean a lot of things. Edit: This is in southwest Virginia near the Carolina border. Elevation is 600 to 700 meters. I'm not sure what you mean by "Up close to it the entire fruiting body seemed pretty meaty as if it would make a great mushroom head on the forest floor". When you examine the surface, can you see very small pores, possibly with elongated/flattened walls? Or maybe small pointed spines? Or is it smooth (to slightly bumpy)? Looks to be possibly past prime. The white areas/cracks may be faded/dried and/or coated with a secondary fungal growth. Or, perhaps the large yellow areas are parts that changed color (from beige/cream/whitish) due to age? Stereum species tend to be yellow, and have smooth fertile surface. But Stereum generally doesn't from such large patches of crust; there's usually some projections (caplike/shelflike) near the edges. 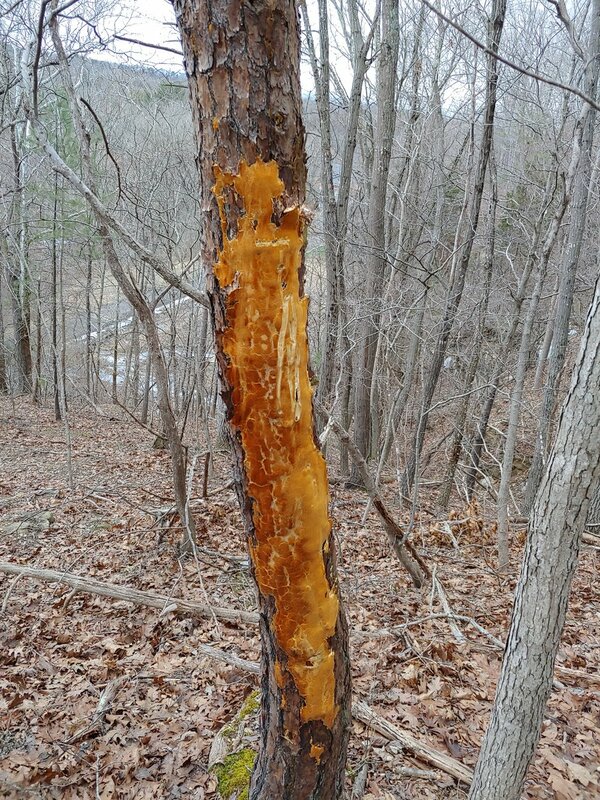 Stereum species favor hardwood. Corticium species have smooth to bumpy surfaces, or maybe with very small pores visible. Some Perenniporia species grow like this. These are hard crusts with fertile surface consisting of pores that may have elongated walls, or maybe tubes terminating in pores. P. subacidus grows on wood of pine. Sarcodontia and Steccherinum species have spines on the fertile surface. I tried to mean there that it seemed like it was the consistency of a portabella cap, as in, if one were to bite into it, maybe it would be a similar texture to button mushrooms or portabella mushrooms. And yes it does seem quite old. The bark of this tree and many others were grossly stripped (where giant chunks of bark were seemingly purposefully removed) so I imagine this fungus grew throughout the gap in that stripped bark. Maybe that could suggest it is more a result of how much bark was stripped instead of typical max growing sizes of particular species? I'm not sure. I'm 100% new to this (started a couple weeks ago) so I apologize if I'm not too helpful. Thank you very much for the suggestions though, I'll search around and see if any of them lead me anywhere. No need to apologize, TinyPeen. 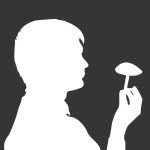 Getting at ways to describe the subtleties associated with fungal fruit bodies is a challenge. One learns over the course of time.